Back in August 2018, developer Felix Rieseberg created a Windows 95 app using Electron, a cross-platform application framework for the desktop. Windows 95 app is around 280MB in size and it can be installed on Windows, macOS, and Linux. Developer Felix Rieseberg, who worked hard to bring back Windows 95 as an app, has just released a new update to the project with much-needed improvements. 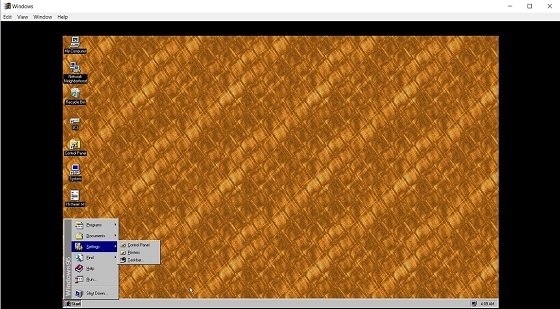 Windows 95 app version 2 addresses the limitations that were introduced in the first release, such as its inability to support the monitors with high-DPI. In the changelog, the developer notes that the Windows 95 app v2 also comes with new features. For instance, you can now access and hear all the Windows 95 sound effects. The update also brings a couple of new games. FrontPage, Netscape 2.0 and other programs are now pre-installed. You run the app on your Windows 10 device to experience the MS Paint, Minesweeper and other programs from the era of Windows 95. ■ A few retro games. ■ FrontPage & Netscape 2.0. Windows 95 app is a third-party program and it is intended to experience Windows 95 which was released decades back. If you are interested, you can download and install it from here. For your amusement, here the Windows 95 Start Me Up Tv Commercial.